... i was a little girl. Hiding on our family building attic (Tavan). It was like, old & dusty, Disneyland just for me. Full of old clothes, books, furniture, paintings, shoes, cuttlery, mirrors ... oh such a magnificent Playground it was. Here i started reading, dancing, performing, singing, drawing, in one word - Creating. After school, studying and really trying to have a ''real&steady'' job - i returned to the place where everything started. Became enterpreneur; food stylist, using Tavan as a studio for creating food magazine photos, collaborating with supertalented photographers and writing first Croatian food blog Sjedi&Jedi (Sit&Eat). That blog was completely my creation AND I've got the opportunity to publish it on a big public platform. Oh how popular it was! That support connected me with amazing, loving & completely affirmative audience (u get what u give! ), wings to fly / grow so I've started another project called Mali plac na Tavanu (Little Market on the Loft). It was a little organic food & natural products market for farmers, creators and people in love with the real food, getting familiar with its source, sharing, tasting, co-creating. ... creation is limitless & u can start creating anytime & what's most important - anywhere! Tavan is very inspiring & live example. Na Tavanu organiziramo sve gore navedeno što hvalabogu uključuje mnoštvo kreativaca, profesionalaca & individualaca; chefova, stilista, umjetnika, vrtlara, fotografa, dj-a, malih proizvođača organske hrane (jaaako nam je stalo da vas kvalitetno, provjereno, svježe, cjelovito & zdravo (na)hranimo), autohtonih, zanimljivih vinara, craft pivara & rakijara te koktel & smoothie majstora. We R organizing everything previously written & thank God it includes so many creatives, professionals & individuals; chefs, stylists, artists, gardeners, photographers, dj's, little organic producers (ooh we r eager to feed u with high quality checked, organic, fresh, seasonal, whole, healthy food), authetntic, interesting wine & craft beer & brandy(grappa) makers, as well as cocktail & smoothie masters. Furamo se na atmosferu, iskustvo, doživljaj, jedinstveni odabir & izvedbu. We R Hooked on atmosphere, experience, unique approach & presentation. Po tome smo - krovni. We R roof - top in that. Na radionicama osluškujemo što danas želimo (s)kuhati & (po)jesti? 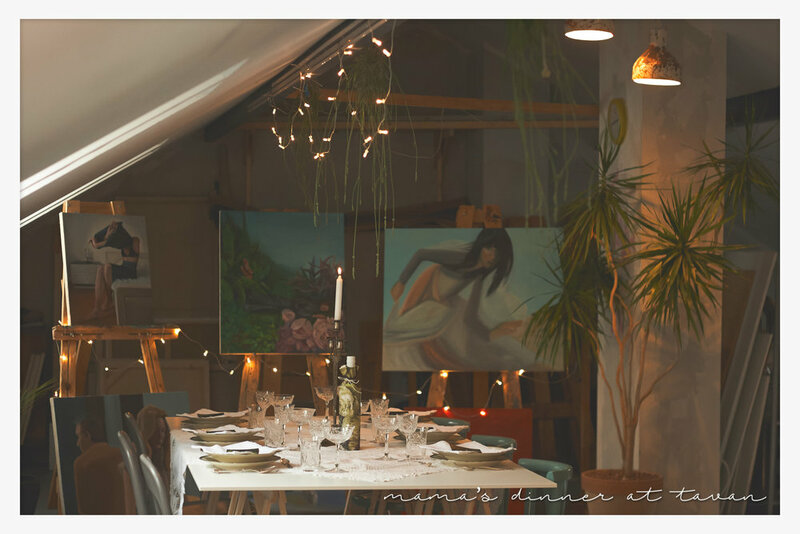 / Workshops are based on Feeling what We would Love to Cook & Eat Today? Konzultiram(o) & stiliziram(o) & kreiram(o) inovaciju, više ljepote & sklada, eklektiku, živu hranu, menije, vizualne identitete/ Na vlastitom Malom placu na Tavanu biram najbolje proizvode i namirnice samo za vas! / Consulting & Styling & Creating Innovation, more Beauty & Harmony, Eclectic, Whole Foods & Menues, Visual Identities / Me & My Own Farmers Market at Tavan; picking best produces & ingredients just 4 u!